A rich and specific culture. A professional ethic. An all-consuming passion. Where the enduring expertise of the artisan confronts the trailblazing imagination of the engineer. Where knowledge and know-how meet and embrace a living history, centuries old. At TAG Heuer, artisans work hand in hand with engineers to reinvent the future. To set records, then smash them. To shock those who say no into seeing yes. To lure time and space, fractions of the immeasurable and unbounded, into their most breathtaking configurations. More precisely: to be the best and the fastest, the most accurate and the most avant-garde. This is Haute Horlogerie by TAG Heuer, a state of mind that exploits, side by side, the pioneering achievements of 17th century watchmakers and the most awe-inspiring technologies of today. TAG Heuer haute horlogerists do not reproduce the amazing achievements of their predecessors — the beautiful minds who set the conventional rules of classical haute horlogerie. Instead, by adopting and adapting the innovative approaches of their forerunners, and pushing these to the outer limits of the possible, they create the classics of tomorrow. Through this visionary heritage, TAG Heuer has earned an asserted legitimacy as the acknowledged master of the technological vanguard of haute horlogerie. The brand’s strongly defined personality is esteemed by peers and fine watch connoisseurs alike. This unique character has engendered the most innovative watches and chronographs ever created. 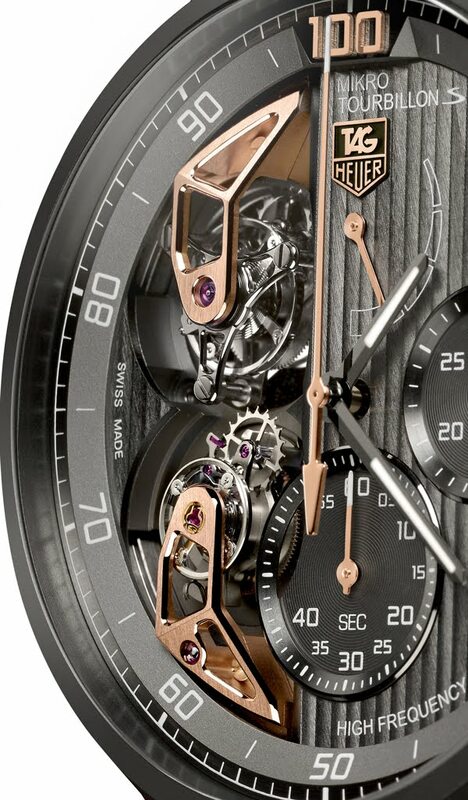 TAG Heuer’s MIKROTOURBILLONS is one of them. Even by TAG Heuer’s own pioneering metrics, the dual-chain, double-barreled MIKROTOURBILLONS, is entirely off-the-chart extraordinary. The first tourbillon chronograph capable of certification-level precision timing, it is by far the fastest, most accurate and most breathtakingly beautiful tourbillon ever imagined. A tourbillon (French for ‘vortex’ or ‘whirlwind’) is the most intricate and iconic complication in haute horlogerie. An elaborate mechanical system for regulating the speed at which a watch ‘beats’, this ingenious complication overcomes the effects of gravity by placing the movement’s balance wheel and escapement inside a rotating cage. Revolutionary when it was invented in 1801, modern precision techniques, many developed by TAG Heuer, have made it obsolete. Yet the tourbillon remains a classic ‘novelty’ feature of many high-end luxury watches because, in its ornate complexity, usually visible through a window in the dial, it is the ultimate attention getter—a showcase of watchmaker virtuosity. Beautifully complex but slow, imprecise and unnecessary: for these reasons, TAG Heuer, the most precision-driven, performance-obsessed of all the high-end luxury Swiss watch houses, had never made a tourbillon escapement watch. That is, until TAG Heuer’s Science & Engineering department, in its pursuit of zero-tolerance chronograph precision, took up the challenge of reinventing the tourbillon, making it not just a delight to look at but, like all TAG Heuer creations, unbelievably fast, precise, and avant-garde. The result is a mechanical wonder that breaks all records for speed and accuracy, and sets the stage for the first-ever dual-certifiable chronograph. The MIKROTOURBILLONS has two rotating tourbillon mechanisms visible on its dial face, one for time telling and one for timekeeping. The first beats at 4 hertz — 28,800 beats per hour — and controls the ISO 3159 compliant watch; its hand sweeps the dial at a standard tourbillon speed of once a minute. 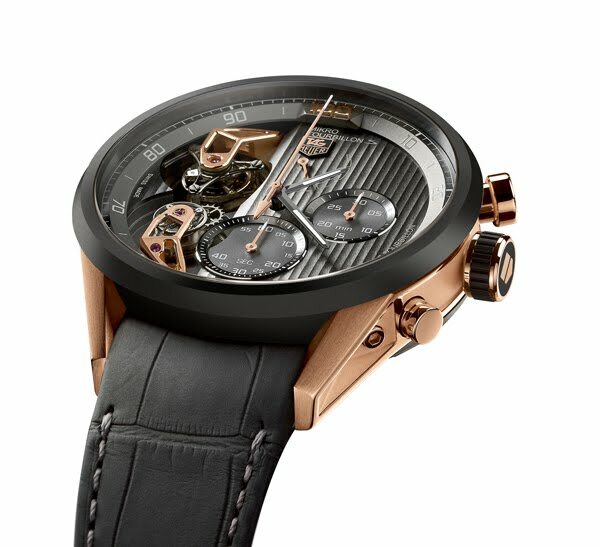 The second, the world’s fastest tourbillon, controls the 1/100th-of-a-second chronograph and is dynamically compensated to run at 50 hertz, meaning it beats at 360,000 beats per hour and rotates at a dizzying five seconds per revolution, or 12 times a minute. Another mind-numbing technical prowess: it has no cage and can be started and stopped thanks to the dual chain architecture. A first avenue of research led to the TAG Heuer Calibre 360 in March 2005 with its additional module for the chronograph. Then the answer came with the TAG Heuer Mikrograph 1/100th of a second Chronograph in January 2011, ingeniously outfitted with two independent kinematic chains — one for the watch and one for the chronograph, integrated in the same movement. The MIKROTOURBILLONS is built with the same integrated movement with dual chain architecture, thereby eliminating the need for a clutch. Separating the watch chain from the chronograph chain eliminates the risks of the chronograph influencing the watch and vice-versa; but most importantly, it reduces energy loss and optimizes the precision of the chronograph’s regulating organ. This dual chain architecture allows the all “MIKRO” timepieces (MIKROTOURBILLONS, MIKROGIRDER, MIKROTIMER and MIKROGRAPH) to be ISO 3159 compliant across the board. The MIKROTIMER and the MIKROGRAPH are already COSC certified — i.e. with the chronograph function running, a feat virtually impossible to achieve by conventional mono-frequency chronographs. The Carrera, TAG Heuer's iconic bestseller since 1963, was the obvious choice of case and finishing for this game-changing chronograph. The materials are noble: highly corrosive-resistant Tantalum with rose gold horns, sublime “Côte de Genève” decoration and a sumptuous, hand-sewn soft-touch strap in alligator. The chronograph minute counter is at 3 o’clock, chronograph seconds at 6 o’clock and a power reserve at 12 o’clock. The once-a-second central flying hand displays 1/10th and 1/100th increments. A single crown at 3 o’clock winds the watch and the chronograph — the rotor winds the barrel on the watch movement, while the chronograph is manually charged. In total, there are 439 components in the movement, many of which are patent pending and all but the two hairsprings built in-house at TAG Heuer’s manufacture in La Chaux-de-Fonds. Now TAG Heuer is working on a first-ever precision certification for chronographs to complement the COSC certificate for chronometers (watches). 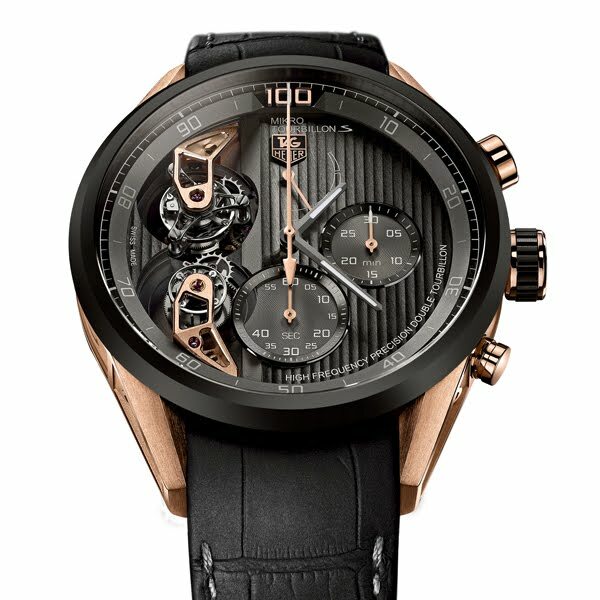 SOLID ROSE GOLD (18K 5N) CHRONOGRAPH HANDS (MINUTE AT 3 O’CLOCK AND SECOND AT 6 O’CLOCK), AND POWER RESERVE HAND AT 12 O’CLOCK.